It happens every year at this time... the insatiable craving for order. How cute is that little weenie dog? I love it! Yes, I love the dog! Where did you find it? love the little weenie dog! such a cutie! That little dog just gave me an ear to ear smile, much like organization does! I know I really want to get home and organize!!! Glad to hear from you again, missed you! Just love your golden dachshund! And he's clearly found the perfect perch. I'm feeling the urge to purge as well - we'll see how far I get! Oh I have a soft spot for Brass figurines! I have a little brass horse that is my treasure. Why not, do a little shopping. There are so many sales right now, anyway. Jealous of your dachshund! I have my own a Jonathan Adler ceramic it's my ode to Timmy! 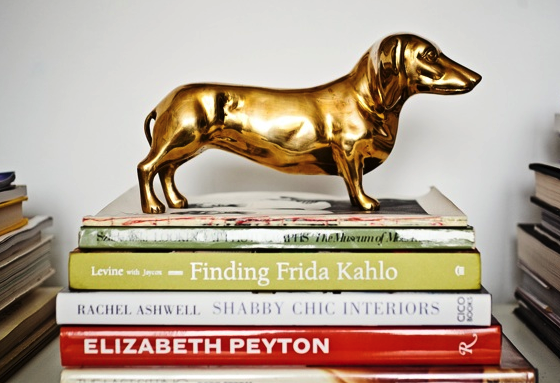 That brass dachshund is fabulous. My real dachshund wants one to give to me!